On Friday, 13 November, soldiers were documented firing 22-caliber bullets at demonstrators during the weekly demonstration against the Separation Barrier in Ni’lin. The shots were fired a few dozen meters from the targets, and lightly wounded two demonstrators. The IDF Spokesperson’s Office confirmed that 22-caliber bullets had indeed been fired. 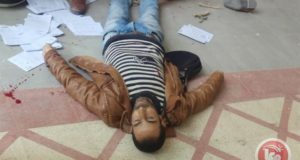 The following Friday, 20 November, soldiers again fired live ammunition at the demonstrators, causing moderate injuries to one and lightly injuring another. In 2001, the then judge advocate general, Major General Menachem Finkelstein, prohibited the use of 22-caliber bullets to disperse demonstrators. 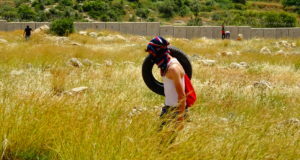 In early 2009, however, the army resumed its use against demonstrators in the West Bank. B’Tselem protested the action. In reply, Judge Advocate General Major General Avichai Mandelblit reiterated that the IDF does not classify the Ruger rifle, which fires 22-caliber bullets, and similar weapons, as means to disperse demonstrations or public disturbances, and that the rules governing their use in Judea and Samaria are stringent, comparable to the rules for opening fire and use of live ammunition. Since then, the army has resumed use of 22-caliber bullets, killing at least two Palestinians in the West Bank, and wounding dozens, some of them severely. 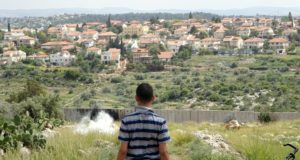 In February of this year, ‘Az a-Din al-Jamal, 14, who was throwing stones with other youths, was killed. In June, a border policeman shot ‘Aqel Srur, 35, in the chest at a demonstration in Ni’lin, killing him. Following that, the army ceased using the ammunition, until 13 November. Real-time observations by B’Tselem and video footage filmed at two demonstrations indicate that the gunfire was completely contrary to army orders. There was no justification to use lethal weapons in these incidents. Persons from the village were indeed throwing stones at security forces on the other side of the fence, but from a few dozen meters away. The security forces found cover behind concrete blocks or inside shielded jeeps, so they were not in a life-threatening situation. The security forces had other means, which cause much lesser harm, that they could easily have used to distance demonstrators from the fence, among them tear gas and an odorous liquid sprayed at demonstrators from a tanker. Following the firing of the 22-caliber ammunition at demonstrators on 13 November, B’Tselem wrote to the judge advocate general, demanding an investigation into the incident, and direction of commanders whose soldiers engage in dispersing demonstrations to again clarify to their troops the rules for using live ammunition during demonstrations. B’Tselem demands that the army immediately stop using 22-caliber ammunition in circumstances in which soldiers’ lives are not in danger, and that measures be taken against security forces who fired live ammunition in violation of regulations and caused the death and injury of civilians.